Some DIY projects demand a lot of attention, depending how used to the craft you are and how objectively difficult it is. In my case, one vivid daydream is enough for me to produce a rather holey woolen scarf that I never really know how to fix. When that happens, I take it to the old lady at the wool store who clicks the needles and fills in the hole in a flash before handing the scarf-to-be back to me, never showing me how to fix it myself. I think she secretly likes the power she has over me by being my scarf-repairer. 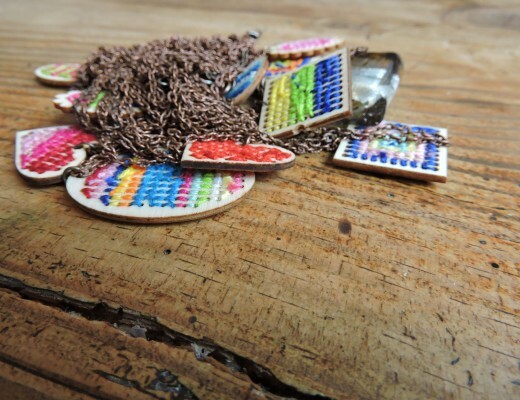 Some crafts have different phases where you need to concentrate more than others, like starting off a big cross stitch project where you need to count dozens upon dozens of tiny white squares so you start the design in the right place. Make a mistake at this point and you will sorely regret it down the line. 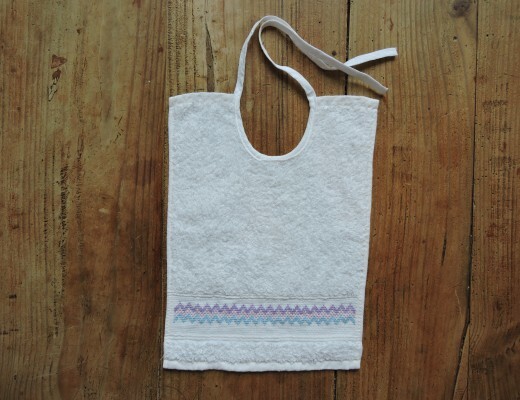 But the more you embroider, the easier it gets to follow the diagram and at some point you can even multitask – gasp! – by chatting to whoever is in the immediate vicinity of your sewing space. And finally, some crafts are made for keeping your hands busy while you watch a cooking show where people criticize each other for undercooking scallops. 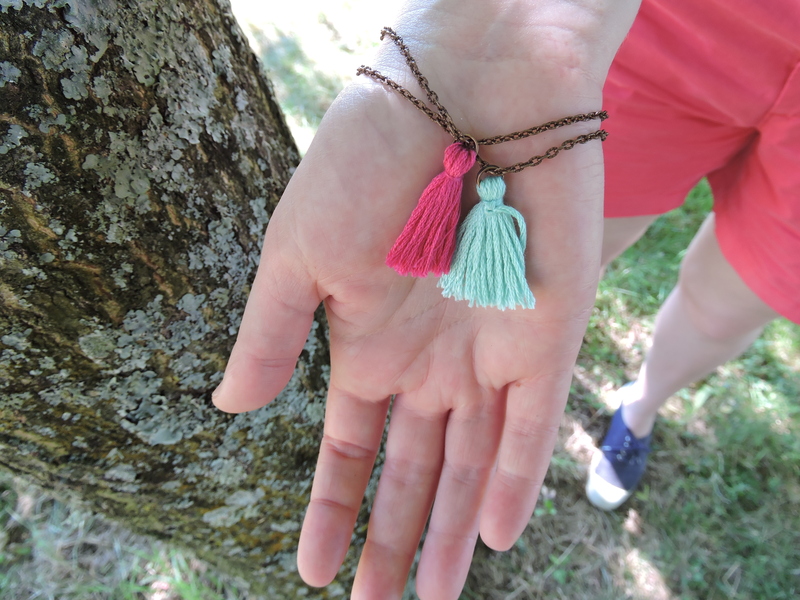 These tassel bracelets are part of this final category! 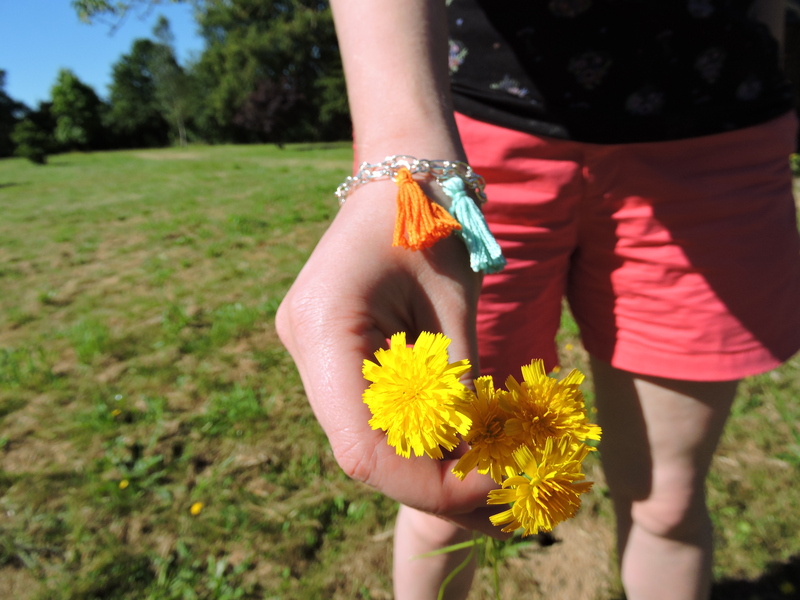 This was not my idea at all, as I saw these bracelets on I Spy DIY and just shamelessly copied them. And it was a lot of fun! 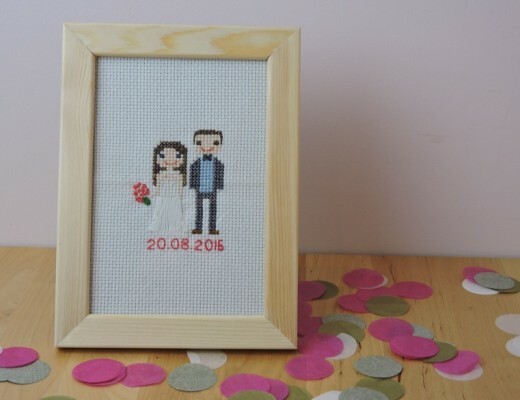 It is a wonderful way of using up embroidery thread in colours that you never use, and I thoroughly enjoyed putting everything together before admiring the final result. 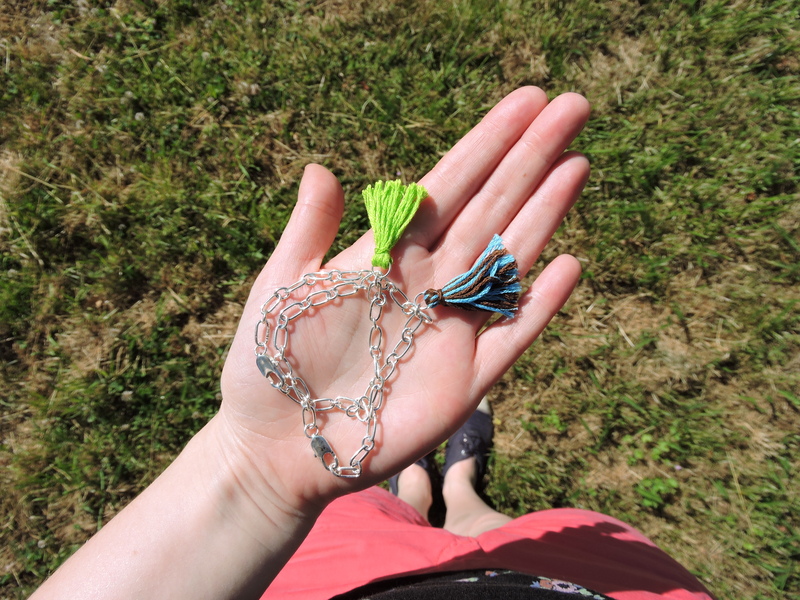 A matching clasp for the future bracelet: choose something that is easy to open and close! A small ring to put the tassel on. This should be easy to open so you can slip it between the links of the chain. 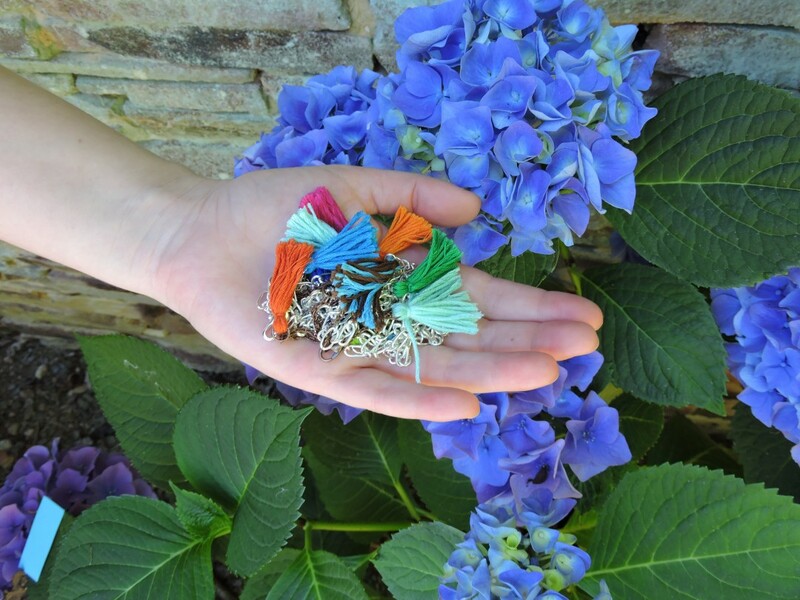 Measure one of your bracelets so you know how long you want your tassel bracelet to be. Then, measure the chain and cut the length you’ll need (17cm for me). Add the clasp to either end of the chain and close it tightly. Check that it is comfortable around your wrist. You might need to use the blade of the scissors to open and close the rings of the chain or the clasp. I used my fingers as well as the scissors for the tougher parts. Cut about 4 cm of the thread, set aside. You’ll use this to keep the future tassel in place. Fully open the ring you will be putting the tassel on, making sure you will be able to add the thread easily. Hold your index and middle finger tightly together and wrap the thread around them, holding the end of the thread in place. Wrap the thread around your fingers about 10 times or until you feel you have enough thread for a nice, fluffy tassel. This is the most finicky part! Carefully slip the thread off your fingers, holding it all together. Slip the bunch of thread onto the open ring, still pinching the thread together, and use your other hand to wrap the 4cm piece of thread around the top of the bunch of thread, the part closest to the ring. Put it all down on the table and carefully knot the thread around the top of the tassel. Make sure the bundle of thread doesn’t slip off the ring! Slide the ring with the bundle of thread into once of the chain’s links, preferably halfway between the two parts of the clasp. Close the ring with your fingers or the scissors. Once you are satisfied with your threads and knot, you can snip through the loops at the bottom of the tassel with the scissors. Trim the tassel so the thread is all the same length. Fluff out the threads with your fingers, and you’re done! 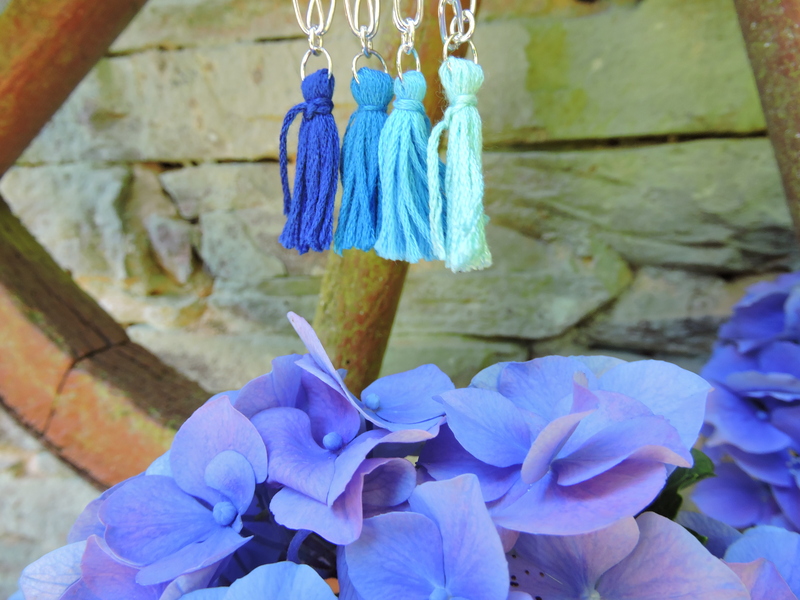 You could of course add tassels to earrings or a longer chain to make a necklace, but I prefer tassel bracelets myself as they add a dash of colour without being too flashy. You could also add them to keyrings, sew them to the bottom of a summery tshirt (provided you tie them on very tightly and avoid tumble drying the tshirt) or onto the lining of a bag. I hope you’ll give them a try, they are a fun, cheap and easy holiday project! This article’s photos were taken in Brittany, where I spent a few days with Maxime a few weeks ago. Once we had finished doing various weird poses in the garden, Maxime’s little cousin wandered up to us and asked us what we doing. When he saw the tassel bracelets, he asked me for one immediately and he was so cute that I gave him one very happily indeed. He wore it for the rest of the day and made me feel ridiculously proud of myself!